The agency model guarantees a higher margin for retailers than did our previous sales terms. We are making this change both as an investment in the successful digital transition of our existing partners and in order to give us the opportunity to forge new retail relationships. The list of Random House imprints is quite large, as shown by this list from Wikipedia. The other five of the Traditional publishers adopted the agency model last spring. The prices for eBook from Traditional publishers rose significantly. Coupled with the news that Harper Collins is limiting library checkouts on ebooks, this is devastating news for eBook lovers who were hoping that the agency model would disappear and market forces could act on prices. According to an piece in Engadget, the Spring Design Alex reader is no more. The reader looks very similar to Nook and the design similarities between the two formed the basis for a lawsuit between Spring Design and Barnes and Noble. Since the success of the Kindle and the Nook triggered a spate of companies coming out with eReaders, I will not be surprised to see more companies abandoning product that cannot successfully capture an acceptable share of the eReader market. Read an eBook Week will be starting March 6, 2011. The purpose of the week is to draw attention to and promote the reading of ebooks. This event has been an ongoing project since 2004. You can get more information by visiting the event’s website. Here at the eBook Evangelist, I have been working on a series of articles to celebrate eBook week, including overviews of different readers, formats, software and apps, and where to find free ebooks. Stay tuned for more! Before you rush out to buy an eReader, there are a few questions that you should ask yourself first. 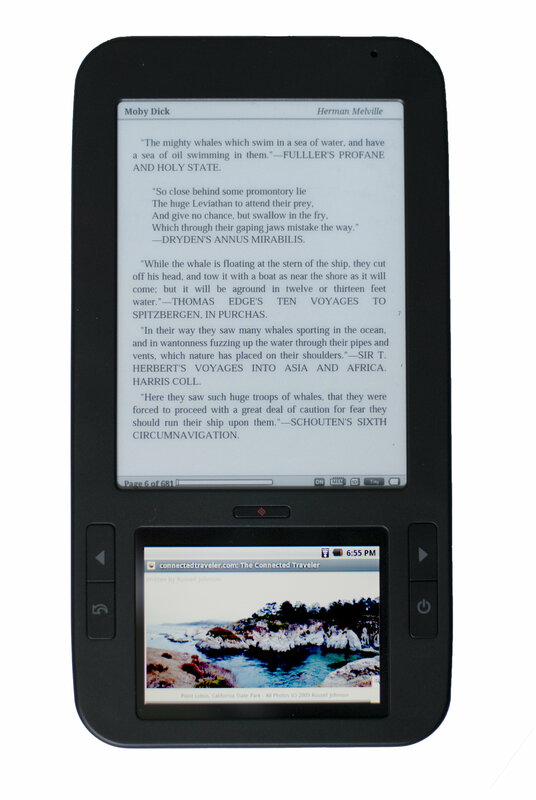 Every eReader has different features as well as strengths and weaknesses. The way you answer these questions helps to determine which eReader will work best for your personal needs. Do you know your reading habits? How much do you read? When and where will you be using the device? Indoors or outside in direct sunlight? Mostly at home or on the go? Do you need a backlit device or one with an additional light? What will you be reading on it? Will you be reading books only, or are you interested in magazines and newspapers as well? Will you be buying mostly new books or older public domain classics? Are you interested mainly in free books? Are you reading academic books or mainly for pleasure? Do you need to annotate text or share page numbers as in a reading group? Do you need special features like voice guided menus, text-to-speech or a touch screen? Do you know what device features are available? Do you need a device which is easy to operate or are you a gadget geek? Which features are most important to you? Battery life, WiFi, 3G, or availability of font sizes? What type of screen do you need: e-ink or color? What about features like a touch screen, book lending, library borrowing, or expandable storage capacity? Do you want a device that can download from anywhere or one that must be used with a computer? Do you tend to shop at one book store more than another? Each eReader is tied to a particular bookstore: The Kindle to Amazon, the Nook to Barnes and Noble, The Kobo and Literati to the Kobo store and so on. Book selections also vary among the different stores. Each store also has different DRM formats which means that books purchased from one store will not be readable on another device. Do you know the readers’ company solvency and committment to the product? Sharper Image and Borders have both filed for Bankruptcy protection. There have been several companies that have announced plans for eReaders which have then been quietly withdrawn such as Copia. Obviously, these issues affect your warranty and customer service support for a reader. What kind of customer service is available for the device? How much customer service are you likely to need? Does the company provide an 800 number? Are there message forums where you can get help from other users? What formats can the device read? Different eReaders use different formats and different DRM systems. Current formats include epub, word, txt, prc (mobipocket), Amazon kindle, PDF. All devices are not compatible with all formats. How many books are available for the device? Amazon, Barnes & Noble, Borders, Kobo, and Google Books all have various numbers of books available, although formats and DRM vary from store to store. Library books may have additional DRM. Make sure that your eReader is supported. Are you located in the United States or outside the US? Unfortunately, there are geographical restrictions on ebook availability. International customers and travellers may see added charges for wireless delivery and taxes such as VAT. This can also be a factor if you travel outside the country. Have you done your research? Read reviews and user forums before you buy. This helps you to get a feel for the experience of using the eReader. I lurked on the Amazon forums before I bought my first Kindle (a $400 purchase at the time). Because of that, by the time I actually decided to buy, I was very comfortable with the Kindle and the pro and cons of the device. Have you tried an eReader for yourself? More and more stores are starting to carry eReaders. Take advantage of the this fact and get a hands-on feel for the device. Try out a friend’s or ask someone about it if you see a reader out in public. Most people who use eReaders are happy to answer questions! Check out stores’ return policies for the devices. Some retailers, like Amazon, offer a 30 day trial period within which the device can be returned for a full refund. By asking yourself a few questions, will be able to evaluate the information in eReader reviews. By using this information to compare eReaders, you will be sure to get the reader that’s just right for you! The eReader of the future…? One of the questions everyone asks is when will there be a color Kindle? By all accounts, color is the next eagerly awaited big feature for dedicated eReaders. Are we there yet? No. But as this video from Sony shows, the research is well under way. So, what’s on your wish list for an ereader feature? Is it color? Video? Leave a comment and let me know! Another the times they are a-changin’ moment: As of today, the New York Times Best Seller list finally includes ebooks. Given the fact that ebook sales have now outpaced both hardcover and paperback sales, it’s about time. E-books available exclusively from a single vendor will be tracked at a future date. That means no J. A. Konrath, no Amanda Hocking, no–well, no anybody who isn’t with a traditional publisher. No matter how many books they sell. Even if they sell more books than the ones listed on the New York Times list. But, hey, it’s a start, right? What do you think? I bought my first Kindle in May of 2008. In the beginning, when I used to take it out with me, no one knew what it was. During the following year and a half, the responses began to change to “Is that one of those eReaders?” or “Is that a Kindle?” Many people still went on to say that they had never actually seen one, but more and more people were familiar with what an eReader was. Over this last week, I was at the hospital twice for some medical tests. Both times, members of the staff recognized the Kindle. One of the nurses was considering buying one for her daughter. One of the lab technicians even told me that one of her co-workers there at the hospital had a Kindle and she was thinking of buying her own. I find these changes especially interesting, given the fact that here in Northwest Indiana, I have never actually seen anyone else with any type of an eReader when I have been out and about. What about you? Any eReader sightings in the wild?